We're long-time fans of Pop & Lolli's wonderful, eco-minded wall decals and now they've released a splash of bright new designs and colors just in time for summer fun and decorating. 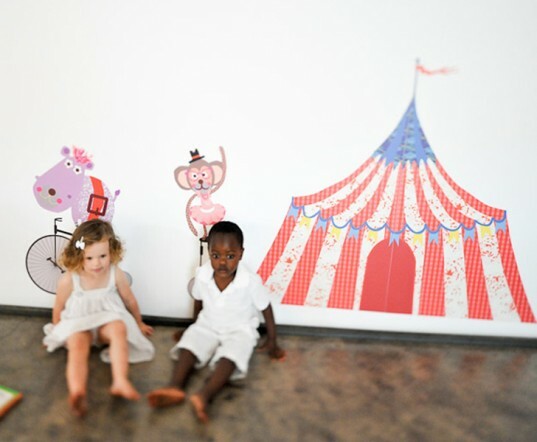 This new summer collection offers wall decals for every child with styles ranging from colorful circus tents to nature scenes to cheerful creatures. Keep reading to learn more about Pop & Lolli's new collection and to be dazzled by all the enchanting designs that will make your walls come to life. 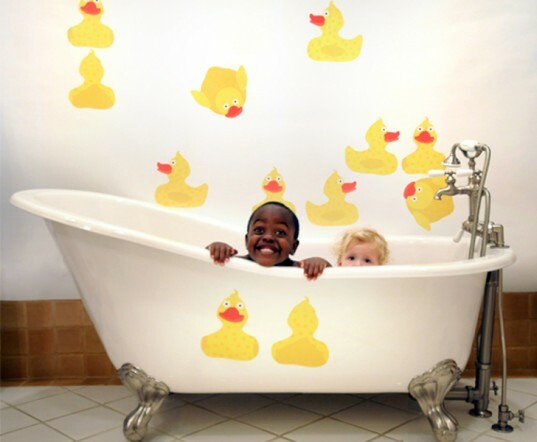 Wall decals have become a hot commodity for baby nurseries, child bedrooms and playrooms in recent years, but Pop & Lolli oversized wall decals are something extra special. Not your typical vinyl decals, Pop & Lolli’s decals are made with fabric for an ultra safe and chic style. These fabric wall stickers use Eco-Sol Max inks, solvent inks that provide durability and UV resistance, without the harsh chemicals used in mild and full solvent printing. Pop & Lolli decals are made to last and won’t shrink, curl, peel, rip easily, stretch, wrinkle, crack, harden or leave a residue on your walls over time. Pop & Lolli wall decals are 100% kid safe decor, made entirely in the United States with ultra premium, very reusable, finely woven polyester fabric. These decals are biodegradable and eco-friendly, and colored with child-safe inks. Water-based adhesives offer decal staying power without harsh chemicals. Beyond the safe, eco-materials used to make the wall decals, Pop & Lolli have a number of other eco-initiatives in place such as digital, not paper receipts and no hefty paper instruction booklets or product inserts are included with your shipment. The company has no paper marketing campaigns, no leaflets resulting in litter and are a cruelty-free company to boot. Pop & Lolli offers dozens of beautiful, cute and nature-friendly decal designs to choose from in a wide array of colors, so you (and your child) are sure to find the perfect wall decals to accent any room decor. There are also some wonderful holiday-specific designs available for birthdays, Halloween and Christmas along with educational designs such as the ABC tree of knowledge. Plus, if that’s not enough, you can even get a custom design made in just about any style you can dream up. 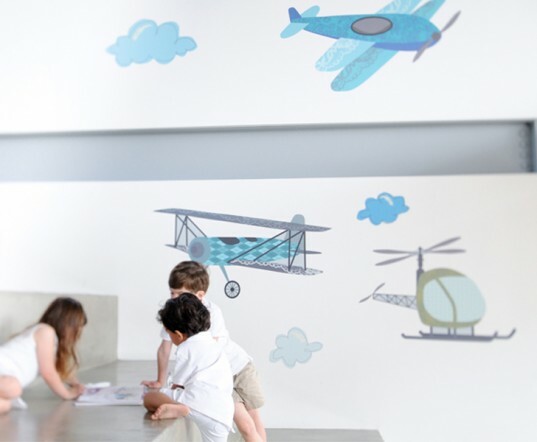 Beyond the wide range of choices, all of these decals are 100% reusable, movable and totally interchangeable, which allows for mix-n-match opportunities to create new playful scenes on your wall. So easy, a baby could do it! Ok, so maybe a baby can’t apply Pop & Lolli wall decals, but parents and even kids can. Unlike common regular vinyl decals, Pop & Lolli decals are super easy to install and play with. Just peel, stick and enjoy your handiwork. Once you get your decals up they can be rearranged and easily removed numerous times. If you order large wall decal sets or complicated shapes, you may need a helping hand or two, but it’s still really easy. Simply place the decal on the wall, start from one end, and gently smooth the sticker out as you go. Keeping these decals fresh and pretty is as simple as using a damp cloth to gently wipe them down. When you purchase Pop & Lolli chic ‘experience-design’ decals you purchase you will be helping to provide educational materials and resources to positively influence a South African child in need, through Pop & Lolli’s chic 2 change program. This program provides earth boxes (self-contained, portable, and reusable fruit and vegetable gardening systems) to hungry children, academic supports and much more to little ones in South Africa. Ordering from Pop & Lolli is a breeze. They have an easy-to-use online shop, decals in various price ranges to fit different budgets, and a great happiness guaranteed policy. If you receive an item that has been damaged, let Pop & Lolli know immediately and they’ll replace it. If within 14 days you find you’re not happy with your purchase, you can return your decals and get a refund, minus the cost of shipping. Note that custom orders are final and cannot be refunded or exchanged. Wall decals have become a hot commodity for baby nurseries, child bedrooms and playrooms in recent years, but Pop & Lolli oversized wall decals are something extra special. Not your typical vinyl decals, Pop & Lolli's decals are made with fabric for an ultra safe and chic style. These fabric wall stickers use Eco-Sol Max inks, solvent inks that provide durability and UV resistance, without the harsh chemicals used in mild and full solvent printing. Pop & Lolli decals are made to last and won't shrink, curl, peel, rip easily, stretch, wrinkle, crack, harden or leave a residue on your walls over time. Pop & Lolli wall decals are 100% kid safe decor, made entirely in the United States with ultra premium, very re-usable, finely woven polyester fabric. These decals are biodegradable and eco-friendly, and colored with child-safe inks. Water-based adhesives offer decal staying power without harsh chemicals. Beyond the safe, eco-materials used to make the wall decals, Pop & Lolli have a number of other eco-initiatives in place such as digital, not paper receipts and no hefty paper instruction booklets or product inserts are included with your shipment. The company has no paper marketing campaigns, no leaflets resulting in litter and are a cruelty-free company to boot. Pop & Lolli offers dozens of beautiful, cute and nature-friendly decal designs to choose from in a wide array of colors, so you (and your child) are sure to find the perfect wall decals to accent any room decor. There are also some wonderful holiday-specific designs available for birthdays, Halloween and Christmas along with educational designs such as the ABC tree of knowledge. Plus, if that's not enough, you can even get a custom design made in just about any style you can dream up. Beyond the wide range of choices, all of these decals are 100% reusable, movable and totally interchangeable which allows for mix-n-match opportunities to create new playful scenes on your wall. Ok, so maybe a baby can't apply Pop & Lolli wall decals, but parents and even kids can. Unlike common regular vinyl decals, Pop & Lolli decals are super easy to install and play with. Just peel, stick and enjoy your handiwork. Once you get your decals up they can be rearranged and easily removed numerous times. If you order large wall decal sets or complicated shapes, you may need a helping hand or two, but it's still really easy. Simply place the decal on the wall, start from one end, and gently smooth the sticker out as you go. Keeping these decals fresh and pretty is as simple as using a damp cloth to gently wipe them down. When you purchase Pop & Lolli chic ‘experience-design’ decals you purchase you will be helping to provide educational materials and resources to positively influence a South African child in need, through Pop & Lolli's chic 2 change program. This program provides earth boxes (self-contained, portable, and re-usable fruit and vegetable gardening systems) to hungry children, academic supports and much more to little ones in South Africa. Ordering from Pop & Lolli is a breeze. They have an easy-to-use online shop, decals in various price ranges to fit different budgets, and a great happiness guaranteed policy. If you receive an item that’s been damaged, let Pop & Lolli know immediately and they'll replace it. If within 14 days you find you're not happy with your purchase, you can return your decals and get a refund, minus the cost of shipping. Note that custom orders are final and cannot be refunded or exchanged.